We are looking for Event Coordinator! 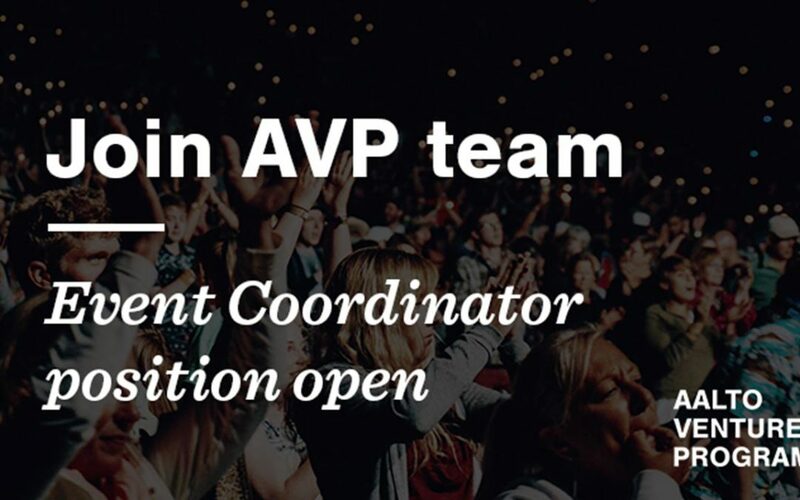 As the current event coordinator of Aalto Ventures Program (AVP) moves to the position of CEO of Junction, we are now looking for a new coordinator to take care of our high-profile events. You will work in AVP Service Team with a handful of dedicated professionals and in participation with a large network of other people who work for and in AVP. You will own the practical arrangements of events of AVP and coordinate the AVP event calendar. You will organize, coordinate and schedule events (e.g. Master Classes, Workshops, Thought Leaders’ Talk -series) and AVP special events (guests lunches, mentors meet-up, anniversary and Christmas parties etc.). You will also be responsible of day to day operations of AVP Space and calendar for AVP Space. More information about the position: HERE or from Mr Kalle Airo. Please apply as soon as possible as we’ll hire the coordinator as soon as a suitable candidate has been found, even before the final deadline. The final application deadline is 7.1.2018.